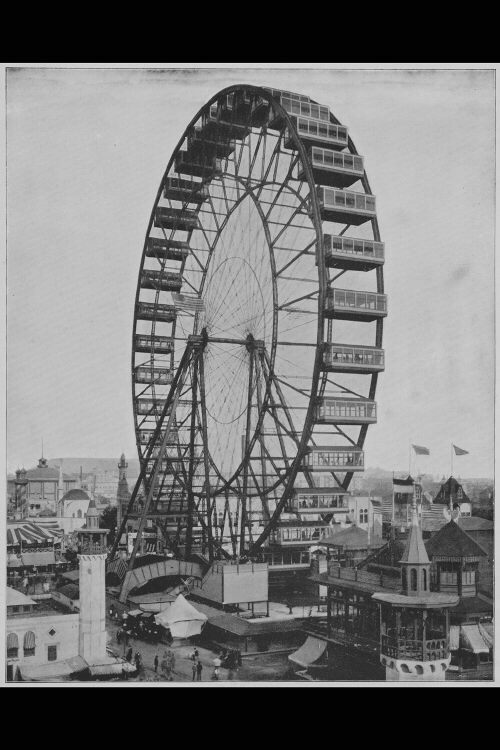 THE FERRIS WHEEL - The chief wonder of the Fair of 1893 was the work of George Washington Gale Ferris, a man born west of Chicago. At a Saturday afternoon club dinner, in a city chop-house, while the Fair was building, Mr. Ferris conceived the idea of the wheel. He there, on the moment, fixed on the size, the construction, the number of cars at thirty-six, the number of seats in each car, the admission fee, the plan of stopping six times in the first revolution to load and another revolution without stopping, and these details, as then instantly recorded on paper, were never altered. This offers one of the most remarkable births of completed ideas to be found in the realms of psychology. The characteristic of the Ferris Wheel is its tension spokes - that is, the spokes that are really in use are always stretched, and only the spokes below the axle are in use; by holding up the lower arc of the wheel, they support the upper arc, making a perpetual arched bridge. The object of the Ferris Wheel is merely pleasure. The sight-seer is elevated two hundred and fifty feet above the ground. The movement is gentle and nearly noiseless. There are cogs on the edges of this vast double wheel, and these cogs work by chains into the cogs of a train of lesser wheels, so that the device is like a clock-train. The axle was forged under the Bethlehem hammer, whose model was shown in the Transportation Building. This axle is forty-five feet long, thirty-two inches in diameter, and seventy tons in weight. It is the largest piece of steel ever forged. The steel towers on which this axle rest are one hundred and forty feet high, and are put into the earth thirty-five feet deep. The wheel cost $380,000, and had earned its entire cost on September 1, 1893, when it forwarded to the Exposition $25,000 as royalty on the first profits.